View cart “Probiotics” has been added to your cart. 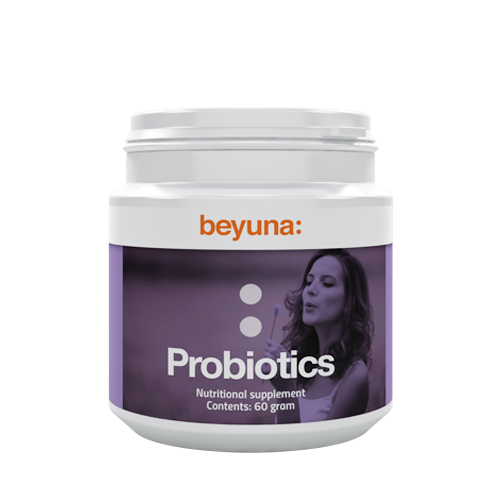 Beyuna Probiotics is a probiotic product with multiple types of bacteria which is called "multispecies". There are also Probiotics with a single bacterium which are called "monostrain". Probiotics with multiple bacteria of the same species are called "multistrain". These products are based on PROBIOACT Technology. Read more about the PROBIOACT Technology under the tab 'Quality'. Allergens: milk and a number of bacterial strains contain milk ingredients. Dissolve 1 scoop (about 2-3 g) of powder in a glass of lukewarm water and leave to stand for about 2-3 minutes. Drink on an empty stomach if possible: in the morning or before going to bed. Probioact technology increases stability and survival of bacteria in this product. Nutritional supplements are not a substitute for a balanced diet. A healthy lifestyle and a varied, balanced diet is vital to maintaining good health. Store well sealed in a cool, dark place and keep out of the reach of children. In addition to the choice of the right bacterial strains, the condition of the bacteria and ease of use are of great importance. That is why Beyuna Probiotics contain the unique PROBIOACT® Technology. This innovative combination of ingredients improves the stability and survival of the bacteria in the stomach. It also means that Beyuna Probiotics can be stored at room temperature.